As mentioned in my final article for last season, I couldn’t be more proud of the 2017 team. They matched the program win record with 10, achieved back-to-back victories against Navy and Bowl opponents, and finished 13-3 in their last 16 games. Moreover, they brought the CIC back to the Hudson Valley after two decades of Squid and Zoomie dominance. The only thing they didn’t accomplish was to finish the season in the Top 25 (which I still disagree with). Maybe not the sexiest way to win, but Coach Monken wasn’t about to let Buffalo repeat the 2016 game. That year, with 11:30 left in the 4th Quarter, Buffalo came back from a 20-6 deficient to win in overtime. This 2017 victory helped the Black Knights avoid starting 1-3 and ultimately, built momentum crucial throughout the record tying 10-win season. Szott’s Fixed Opinion: This play is the perfect intersection of surprise and exhilaration for coaches, players and fans alike. In fact, Nick was the only person who knew what was about to happen in this “No! No! Go! Go!” play. He had the exact mixture of boldness and success to keep his starting job on Monken’s A squad. This play continued a three game winning streak in the middle of our season. It also continued the “We own the 4th Quarter” mentality that helped us finish close games throughout the year. This guy was on soft shoe profile the following Monday. 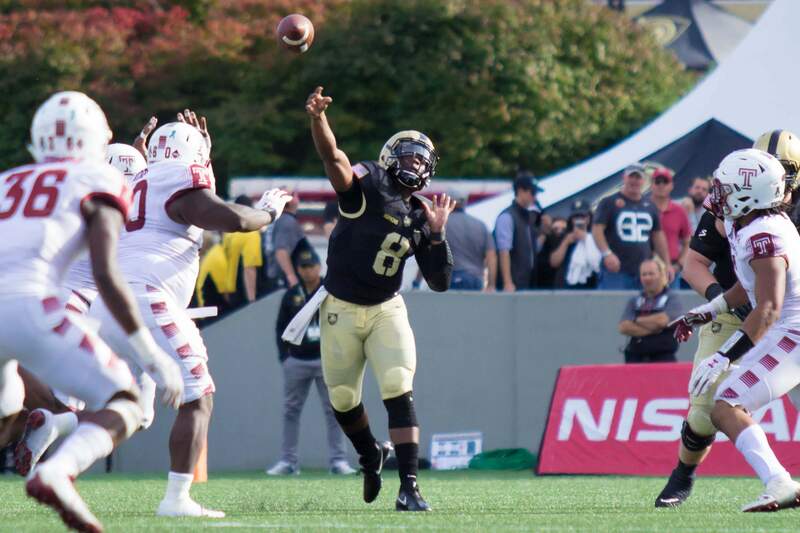 Szott’s Fixed Opinion: This hard-nosed, clutch play displays the changing tide of Army’s fourth quarter luck. The 2015 season was marked by countless close calls and bad breaks but in 2017 the pendulum fully swung our way. This highlight against EMU combines effort, execution and the right amount of luck. Unbelievable game-tying drive. This is a glimpse of what Kelvin Hopkins can do. In one drive, he came in and threw for 20% of our total season passing yards. Clearly we weren’t the most dynamic offense in college football but it does give confidence in Hopkins’ poise under pressure. Let’s be clear though…WE ARE GOING TO RUN. Don’t think you’ll see anything other than dead last in FBS passing this year too. Thanks to Aaron Boumerhi for missing a 27 yard field goal in overtime to confirm the win. Also, great call by Saint Monken not to go for the 2 point conversion. Szott’s Fixed Opinion: Granted, every time Army puts the ball in the air there is equal potential for highlight or disaster. This play stands out because this run-dominant offense adapted and executed under pressure to come out victorious. It is an essential highlight from 2017 while remaining relevant given Hopkins’ key role going into 2018. In my Bowl game superlatives, I gave Jaylon McClinton a Grant Turnaround APFT for engineering this interception. His TAC said his score is suspiciously lower than last semester. That 1.95 miles course always helps out. In all seriousness, this play prevented 21 unanswered San Diego State points and an impending bowl loss. Shutting down this touchdown stopped a 14 point SDSU lead beginning the 4th quarter. Army just isn’t made to come from behind like that. 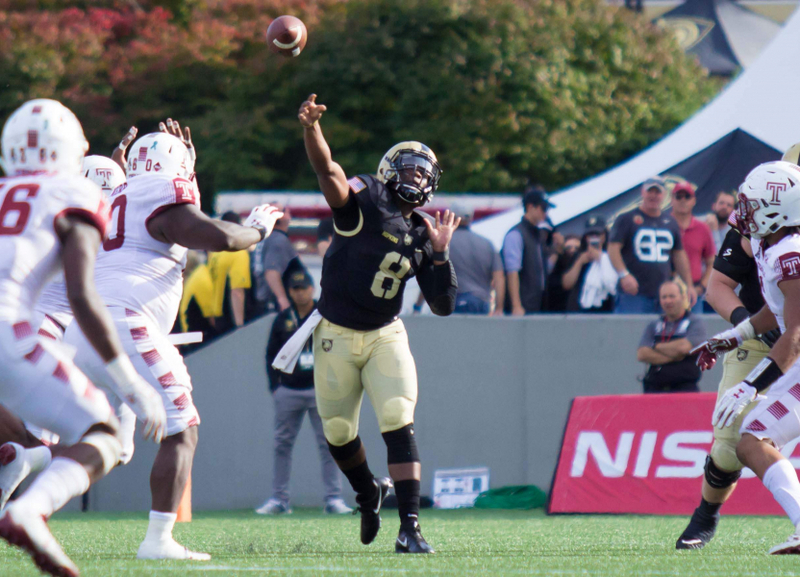 Szott’s Fixed Opinion: Making ESPN’s Top 10 during Bowl Season, this play captures how the 2017 Army Defense consistently swarmed to the ball and hunted for the turnover. Winning the turnover margin is particularly crucial to Army’s style of play (they were +5 in 2017). Aukerman’s pick was icing on the 2017 turnover cake (or was it Martha Washington cake). Cadet Voit received a Firstie APFT Exemption for this play in my Superlatives last here. Running down Malcolm Perry like the trash can at the end of the two-mile course is no small feat. Had Navy scored on this drive it would have been 17-7. Instead, they settled for a field goal allowig our go-ahead touchdown drive, making it 14-13. A little help from Navy’s kicker (making him Army Player of the Year) sealed the Army Victory! Szott’s Fixed Opinion: I agree wholeheartedly with the position of this highlight given Voit’s performance, the situation in the game, and the undeniable weight of the Army-Navy game. On that snowy day in December, the eyes of the nation witnessed a display of pure grit and perseverance upon Philadelphia’s field of friendly strife. This play epitomizes Army’s 2017 effort. Every time the season started to get away from them, they fixed their gaze, buckled down, and imposed their will. Attention all Cadets! Duke Game Preview and Season Predictions Coming Soon. REST.